It’s not every day that someone contacts me for permission to use my artwork for publications. One of my paintings is on the cover of a brochure for a water company in Finland, and UC Berkley used an image for a conference brochure. Recently, a science institute asked to use an image on the cover of the proceedings for their conference. Since most of these uses have (what I assume to be) limited commercial value, I usually thank the person that asked and give them the rights to use for free. The latest, “Proceedings of the International Conference on Shape Memory and Superelastic Technologies” seemed like an opportunity to tell you about these requests, because you might learn something that helps your art become more discoverable. Over the years, the source of traffic to my blog and website has been fairly consistent (except that Facebook is now the 2nd most important source, after Google). The sources in order of volume are: 1) Google; 2) Facebook; 3) Bing; 4) Yahoo; 5) Twitter and 6) Google Images. I’ve summarized/consolidated this data (eg, international versions of Google are part of #1, “Google”), but this gives you a rough idea of where you may source business online. The lesson I’ve learned about Google (and Google Images) is that it’s really important to think about how you name your image files. At least two organizations now have asked for my Asilomar images, and doing a Google Image Search, you’ll see I have 4 paintings in the search result. I tried searching another of my painting subjects (“Stow Lake Bridge“) and the only two paintings I’ve done of that bridge are ranked #3 and 4, respectively, the first images after the official photographs of the bridge by the city. I also sold some paintings to a hotel on the Truckee River last year, and when I search Google Images for that, I’m the first painting/non-photograph in the results. I think my complete naming of the image (always the place in the title, and sometimes I add the city and state) helps to drive a surprising number of visits to my website. Then again, Google is customizing search results more and more, so I’m not sure if the typical user is seeing these results, but they must be seeing something similar since they are driving business. Try searching the the names of places you typically paint. Are your images showing up? Are they driving traffic to your website? The results may surprise you. Facebook Marketing Test – Wanna Help? I was on an industry analyst call the other day, and researcher said that a full 20-25% of all page views on the Internet now are for Facebook! Can you believe it? March last year Facebook surpassed Google as the #1 visited site in the US. With these stats in mind, you can’t ignore Facebook as a marketing tool for your art business. I’ve had a Facebook Fan Page (post here) and have tested advertising (2007). I think most of my art sales are via this blog, but I get more engagement (comments, “likes”, etc) on Facebook. My bet is that more collectors (and other artists) are discovering me first now more through Facebook than Google, but that’s pretty difficult to measure (and I’d rather spend the time painting!). My latest test of Facebook marketing (I hope you’ll participate and help me measure it!) is use of the “Like” button. You can add a “Like” feature to any web page. When someone clicks the Like button, it adds the web page to their Facebook newsfeed and any associated images. By adding to the newsfeed, you’ve extend your reach to that person and their friends (via the “Social Graph“). I’ve now added a “Like” button to every painting on my website (because each painting is a unique image URL), all blog posts now have it, and my website overall has it added. Like me, like me! Can you help me test this out? Please visit my main website, go through the online gallery and “Like” paintings (also, add a short comment if possible). I’d love to see what happens, and I’ll write a followup post on this in the next couple weeks to show you the results. And, some early insights into what may happen. I liked one painting to test it, it showed up in my newsfeed, and I already (within 30 minutes) have other friends liking the painting (including Stephen Doherty, editor of PleinAir magazine!). Looks like this could work. The return of Plein Air Magazine! I’m also happy to say I will have an role in this rebirth, serving on their Advisory Board. I’ve already sent Stephen a list of artists I hope to read about in the magazine, with a slant towards the unknowns, and those better known outside the United States. I’d love to hear your thoughts about who you’d like to read about—please take a moment to enter a comment. I have a few shows coming up that you may be interested in. Hope to see you! Viewpoints Gallery – Two-Man Show with Andy Balantine. July 6-31. Reception: Saturday, July 11, 2-5PM at the gallery. 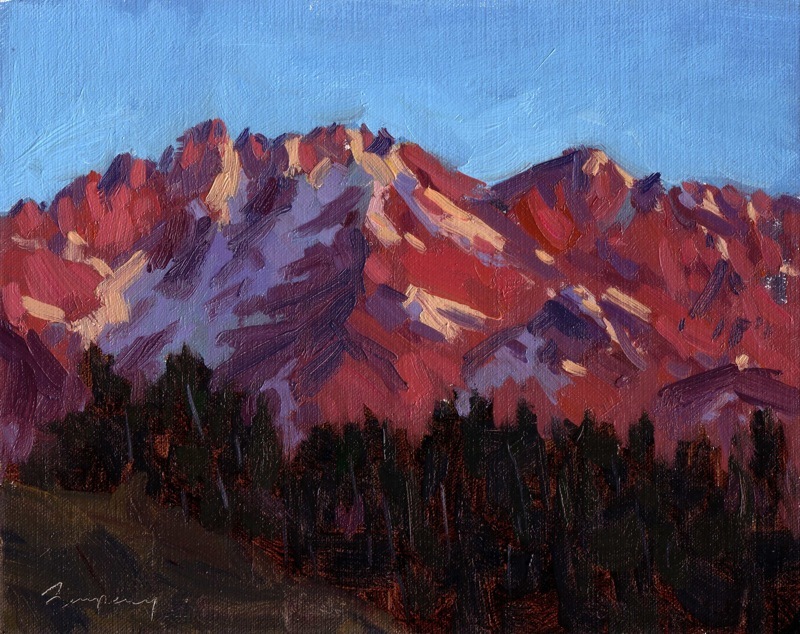 North Tahoe Plein Air – I will be painting on location Wednesday – Friday, September 9-11. The silent auction, demonstrations and public sale will take place at the Village at Northstar on Saturday and Sunday, September 12 and 13, the same weekend as the Autumn Food and Wine Festival. The show and sale of paintings will then move to North Tahoe Arts in Tahoe City and continue until November 1st. San Luis Obispo Plein Air – I will be painting throughout San Luis Obispo September 28 – October 4th. A paid “Collector’s Party” will be held October 2nd, 4:30-6:00pm at the Art Center, then a public recpetion as part of the art walk from 6-9pm. Saturday, October 3rd is the “Quick Draw”, during which all painters will have two hours to paint a scene anywhere in the city block around the Art Center and Mission Plaza, followed by a live auction of the completed paintings. Paintings will remain on sale Sunday, October 4th at the Art Center from 10am-6pm. This latest painting is included. It was painted from a reference photo I took at Telluride, Colorado. The funicular in the valley floor takes skiers in Winter to the top of a local mountain. In summer, it’s a great place to visit. I was there last year as part of Telluride Plein Air. The photo was taken in late, late afternoon. I love the light during this time! I’m leveraging my tech + marketing background to try a few more tricks on social networking site, Facebook. I’ve written before about my Facebook Ads test. I’ve been moderately happy with the results. My new test involves Facebook’s “Fan” pages. Just as you can “friend” an individual, you can “fan” a brand or person you like, like the iPhone or your favorite TV show. This allows you to get updates from that brand/person/product in your Facebook Newsfeed, just as you get updates from your friends. Check it out, let me know what you think, oh…and “Fan me!” (click “Become a Fan” in the right-hand side bar of the page). I wrote last month about my latest foray into online sales, Facebook advertising. I’ve spent time on Facebook for both my art career (including the Facebook Group, “Plein Air Painters“) as well as for work at Wells Fargo, where I manage their Social Media team*. I think Facebook is doing a lot of smart things, and their new ads are no exception. Unlike many sites, Facebook contains a lot of information about their users, including their interests, gender, age, home town, etc. I know this worries some people, but not me. If by providing this information I see ads that are more appropriate to me, great. I’m going to see ads anyway, why not see ads that meet my interests? Although I only started November 18, I do have some results to share that seem interesting. I’ve never purchased online ads (for my art career) before, so I don’t have much experience to benchmark, but I can calculate a “back of the envelope” ROI that seems pretty good. The Ad Campaigns pane above shows my 6 ads running for this campaign. I was able to define very specific target user demographics for each ad I created. As you see below (left side of the screen shot), and ad consists of a small image and text. For example, in “Women Still Life Campaign”, I created an ad with a still life painting, introduced myself as the artist selling the work, and targeted women between the ages of 35-65, college educated, who like art (as defined in their profile). When you define an ad target and enter the user demographic you want to see the ad, Facebook will tell you exactly how many people are in their community that meet your criteria. This is really helpful. In one case, I tried to get too targeted, and found there were less than 1,000 people that would see the ad. So defining your demographics is an art in itself: make it narrow enough to reach the people you think will connect with the ad, yet make sure the population is large enough so you’ll get ad impressions on the site and have a large enough pool of people to see it. For the seascape ad, I targeted both male/female, 35+ and selected only upper class coastal towns in California. Fine tune the $ CPC. You need to experiment with the CPC (cost per click) you’re willing to pay. I started at 0.11, and found I got very few impressions. The Facebook system will obviously choose to display ads at the highest CPC possible, so if you’re underbidding other advertisers seeking the same user demographic, you won’t get impressions, which means you won’t get clicks that can then lead to sales. As you can see above, I’m paying between 20-30 cents per click. Be creative. My ad that targets hikers has been particularly successful. I just thought, when I’m out painting, most of the people I run into are hikers and they seem the most interested in nature + art. Not surprising, right? For my still life ad–sorry in advance for being sexist!–I targeted older, college educated women. I’ve found that they’re the most likely to buy my floral still life paintings, so I transfered that practical experience to online ads. The great thing about their system is you can create lots of ads and experiment, see what works. Select the right image. The image you can select for the ad is around 100×80 pixels. Small! So, pick a painting (or fragment) that is really easy to “read” at that size. Also, perhaps not surprisingly, my most successful ad (in terms of % click-through) was the one that featured my headshot, not my paintings! I don’t know what to take that! Other than the fact it IS a SOCIAL network, so people are there to connect with others. If you present YOURSELF first, it appears people are much more receptive. Have the ads been successful? I’ve spent $82.96, and I’ve received three email inquires and had a sale of two studies for a total of around $400. Bottom line, I’m not sure. I guess it was worth it. I had $400 in sales by spending $82. What do you think? I’m going to try this a few more months and see how it trends. Also, thanks to Donald Neff for this article that also looks at how artists can use Facebook to target buyers. It doesn’t talk about specific results (as I do here), but provides a good overview of how the system works. * I should mention that my opinions expressed on this blog are mine alone, and not that of Wells Fargo. Disclaimer over! My Online Store Launched Today! How many open studios have you done? They’re a lot of work, right (Mike Bailey)? There’s got to be another way. I’m a “high tech” guy–that’s what people call me, usually other artists–so I decided to try something different, an online-only Open Studios sale. I’ll advertise using my online resources, like online ads, social networks, this blog, email lists I belong to, etc. It’s a good test. All my paintings are in an Excel spreadsheet, so I selected paintings for sale and used “mail merge” in MS Word to generate the HTML for the site. I’ll let you know how it goes, and be happy to share my code if anyone is interested. Let me know if you come across any problems, or have any suggestions. Happy shopping! Okay, call me an addict. First, there was chocolate (thanks, mom! ), then, my “Crackberry“, now Facebook. What can I say, I get obsessions. Art is an obsession, no harm in that, right? One of the features on Facebook I’ve decided to try for my “virtual open studio” (ie, cleaning out my studio sale) is “Facebook Flyers”. It’s a neat idea. Remembering that Facebook is built around the idea of friends, virtual neighborhoods and so on: at home, how would you advertise a garage sale? Sure, start with Craig’s List…but you’d post fliers, right? That’s the idea with Facebook flyers. You can post advertisements that feature your sale, and most important: target them to networks, be it neighborhoods or schools. So, I’ve devised a little test. I’ve taken one of my paintings from my “virtual open studios” and targeted it using Facebook Flyers. The one I selected was my painting of the USS Hornet for the “Jewel by the Bay” paint out this past summer. So now the question is, where do I target? You can target by gender, age group, neighborhood and school. There’s Alameda…yes, I could target delivery of the flyers to people that live in Alameda where the USS Hornet is docked. But I realized there is a school of alumni that may be most interested, the US Naval Academy! So, there it is. My Facebook Flyer, targeted for delivery (5,000 flyer ads for $10) delivered to only current students and alumni of the US Naval Academy. I’ll let you know how it goes. To learn more about Facebook Flyers, check out Charlene Li’s Blog, “Groundswell”.